SNES Ranma Nibunnoichi: Chougi Ranbu Hen (JPN) in 11:10.3 by Hiryuu. 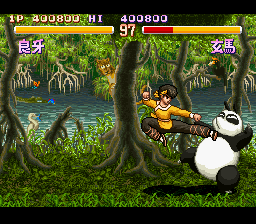 Ranma Nibunnoichi - Chougi Ranbu Hen is one of three Ranma 1/2 fighting games that was released for the SNES. It was planned to be released in the US as Ranma 1/2 II: Anything Goes Martial Arts by DTMC, but DTMC went out of business. A direct translation would be "Super Skill Wild Dance Chapter", but it is commonly referred to as "Super Hard Battle". The story involves collecting the 12 ingredients of the Maneki Neko, which will then grant a wish. This run does what it can to show off the game's combo system while still completing the battles quickly.